ONE pleasant summer evening, a year or two ago, a man sat on the Embankment, near Waterloo Bridge, staring vacantly before him with lacklustre eyes, like one who, having sight, yet sees not. Poverty was written on his shabby clothes, hunger on the lean, haggard, face, and in the eyes—black despair. Such a man, with such a look, might well be contemplating self-destruction—and it was so here. Yet Wilfred Hastings was scarcely thirty years of age; and, up to seven years or so before, he had been used to luxury and wealth, and had his horses and his servants, and—as he thought—a circle of fashionable "friends." At Oxford he had been both popular and successful, alike in study, and in nearly all kinds of outdoor sports. Then had come the crash; his father lost all his wealth and died, leaving his son penniless. Wilfred, undismayed by this reverse of fortune, had applied himself pluckily and manfully to carve out a future for himself by his pen, but ill-luck had seemed to pursue him. He laboured on through disappointment after disappointment. Gradually he had got worse and worse off, till his friends and such few distant relatives as he had dropped away from him disheartened, their patience exhausted by his numerous "failures." And now it had come to this, that he had been turned out of his last lodgings two days before, and had passed two nights sleeping out on a seat on a common in the suburbs. He had had no food for forty-eight hours, save some dry bread. What wonder he was listening to dark thoughts now—thoughts that had often come before, but had always, till now, been driven away! "A few hours," he muttered, "and it will be all over. When it gets dark—yes—when it gets dark. Let me see that I have nothing in any corner of a pocket that might identify me." 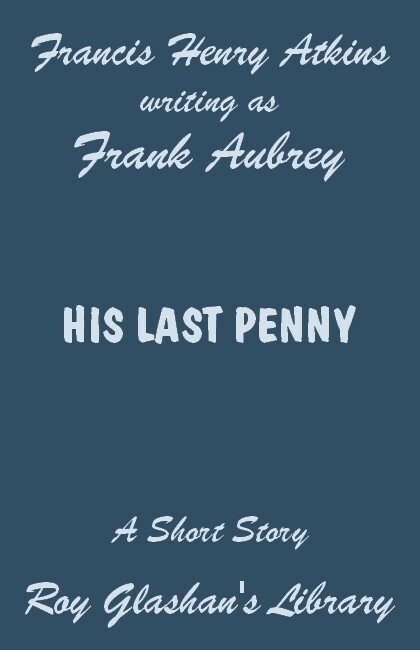 He went through all his pockets, and finally drew out a penny, which he regarded with a half-bitter, half-friendly look. "My last penny," he mused, "and that a bad one, else it would have been exchanged ere this for bread. But no one would be likely to take it. That's why you've stuck to me, my friend—because you're a 'bad un.' But I don't think it will be to my advantage for you to stick to me any longer When I'm found, they may as well not find you, so here goes. Good-bye, old man—the last friend that has stuck to me!" He was about to throw the coin away, when it slipped from his hand and fell on the pavement with a loud ring. "H'm! That's odd," said its owner, picking it up. "Sounds as if you were good after all! Perhaps you're not a 'bad un,' but, like me, only a 'failure,' and the metal beneath may be good and true for all that may appear to the contrary. If that is the case you shall stay with me to the end. A 'bad un' was different; but a 'failure'! Why, we are fellow-sufferers, and ought to stick to each other!" He paused, and turned the penny over and over absently in his hand, while from the gardens near came the sound of some gay music that one of the evening bands was playing. It brought memories to him that were too painful to bear; he must get up and do something, he felt, or he should go mad. First, however, be apostrophised the coin again, before putting it back in his pocket. "You aught to know, my friend," he said, with a sigh, "anyway you have learnt by this time, I suspect, that there is no place for 'failures' in this world. The thief, the gambler, the drunkard, the violent, the maniac—even the crippled, and the incurable—these all have places for them; but for a 'failure,' an able-bodied 'failure,' like you and me, there is no place; no vacant rung on the ladder for us to rest on. You are only good to toss with, and I do not want to toss, and so—"
He stopped and gave a half-smile; such a smile as might haunt the memory of anyone who had seen it. "Yes," he said, "why not? I must do something to pass the time. I'll take a 'toss-up' walk. I never did such a thing before in my life; I have heard of it, though, and I'll try it. Now, my friend, you've got to direct me which way to go. Do your best for once in your life; keep me amused, give me something to think about. But first, let us arrange a little plan. I can't stop and spin you in the air at the corner of every street; I can turn you over and over in my pocket, and then pull you out and see which side is up. Yes, that's all clear, and now fire away. Mind, if you direct me into the water, I shall go!" `Having thus arranged the plan of procedure, he started. The turnings of the penny on the system he had arranged led him to Waterloo Bridge up the steps into and across the Strand, and past Covent Garden Market. Then along Garrick Street, through a narrow court, along another street and round two or three turnings into Shaftesbury Avenue, where it guided his course in the direction of Oxford Street. "Well," Wilfred remarked to the coin, while he held it in his band, "you seem to know your way about anyhow. If I'd wanted to come here I couldn't have chosen a more direct course myself." "Ah! I've got you, my man. You scoundrel, I've caught you, have I?" These words were uttered, in a loud indignant tone, by an elderly gentle man, who seized Wilfred by the collar, and was shaking him violently. In his present state of mind be cared nothing what became of himself; and even when a crowd collected, and he found himself threatened with being given into custody charged with robbery with violence, he treated the matter with indifference, and scarcely even took the trouble to get out a feeble denial. "What does it matter?" he thought, miserably. "Well, I don't see what it matters, If it is to be, it will be, and I shall accept my fate, whatever it may be." But the old gentleman was accompanied by a beautiful young girl, who looked curiously and sadly at Wilfred, and he read in her tender eyes wonder and compassion, mingled with a sort of horror. Her looks inspired Wilfred with a sense of the misconstruction that might be placed upon his silence; so he turned upon his accuser with a more indignant denial, and a determination to shake off the grasp which was still upon his coat collar. A short, brief struggle ensued, and then Wilfred shook himself free, but, reeling back as he threw the other off, he slipped and fell in the roadway under the wheels of a light van that was passing at the moment. When he was picked up, he was bruised, bleeding, and unconscious, and—a policeman coming up—he was soon carried away to the nearest hospital. Here his assailant wrote down his name and address—Marcus Newland, No. 10, Queensgate, Kensington, and then left with his daughter. Their carriage had been waiting for them in Shaftesbury Avenue, and they made their way to it. As they were driving home, the girl hid her face in her handkerchief and cried softly to herself. "What is the matter, Lucy?" asked her companion. "This is an unfortunate business—for the thief—of course; but I don't see you need worry like that over it. If blackguards like him get into accidents in trying to run away when they are caught, I don't see there is so much to be sorry for. It would be a good thing for the world in general if they all got into similar trouble; unfortunately, they don't, or we should get rid of them at small expense." "Why did he refuse his name and address? If I had made a mistake he had no need to try and run off. He should have offered to go to the police station and there have the matter investigated. Can you explain that, if he is innocent?" TWO or three weeks passed, and Wilfred Hastings still lay at the hospital without showing any sign of recovering health and strength. This puzzled the medical authorities, since his hurts had not been serious. No bones had been broken, no vital part injured, so far as could be ascertained; yet his condition exhibited in spite of all the care given his case but little evidence of improvement. He passed most of his time in a comatose state, scarcely eating or drinking, and nearly always sleeping or dosing. At last the house surgeon began to have some suspicions that the patient was malingering, and set to work to find out what was at the bottom of it all. He made many endeavours to talk with Wilfred, but, at first, with small success. He found great difficulty in engaging him in conversation, but something in the feeling of abject misery that he thought he could read in his eyes led him to question the sick man in a manner that won his confidence, Then Wilfred told his story, still obstinately refusing to give his name. "If I am to be taken from here to a police station," he said sadly, "to be accused of an infamous thing, of which I am incapable, I am determined, at least, that none shall know my name. The shame shall not fall upon those who still bear my father's name." When his clothes had been searched with a view to identification, nothing had been found but a pocket handkerchief, the 'bad' penny, and a bundle of manuscripts. These bore no name or address; or other means of identifying the writer. After some consideration, the house surgeon determined to call upon Mr. Newland and have a talk with him upon the matter. Punctually at the hour fixed upon, he drove up to the door of Mr. Newland's dwelling in that collection of palatial residences known as Queen's Gate. But he found the old gentleman far from conciliatory. He stuck to his first position. "If he declares I have made a mistake," said he, "let him give his name and address, so that we can make enquiries about him. If he is innocent, surely he has nothing to fear. If it had been proved to me that I had been wrong, I should grieve more than I can tell you. I should feel it scarcely possible to recompense him adequately; but, as things are, I maintain that I have no reason to doubt what I consider the evidence of my own senses. A man ran against me, knocked the down in the most cowardly, brutal manner, and stole my watch and chain. He might have killed me. He didn't stop to see, be didn't care. I say that this is the man. Why should I pity him? He had no pity for me—or my daughter. Had she, through his crime, for instance, lost me, she would have been left an orphan. She has no mother, no friend in the world but myself. I must think of her, sir, as well as of men like this scoundrel." "That is very true," the surgeon replied. "Yet you have not had this man under your observation day after day as I have. I do conscientiously believe that the shame of this thing hanging over him is weighing on his mind and keeping back his recovery. Now that would hardly be the case if he were the confirmed scoundrel you believe him. Besides, these manuscripts were found on him. They are, as I understand, in his handwriting. I have looked them through, and, though I do not pretend to be a judge in such matters, they seem to me to have some merit. At least, they exhibit a desire to earn money honestly. Suppose, even, just for a moment, that this poor wretch yielded to sudden temptation because he had failed to make money by his writings, and was starving, would you, in such a case, regard him as you now do?" "Well, of course, that would make a difference," Mr. Newland admitted, with hesitation. "But the manuscripts may not be his; he may have stolen those, too. However, as I have said, I wish to be just. Leave the manuscripts to me. I have had much experience in that line; I own five or six well-known publications, in fact, at the present moment. If there is any merit in them, andiIf they should prove to be his work, I should, as you suggest, be inclined to take a munch more lenient view of the affair." DURING the next two days, spite of the many pressing calls upon his attention, the house surgeon's thoughts often reverted to the subject of his talk with Mr. Newland. He frequently found himself wondering whether he had been misled by his own feelings to take trouble about an undeserving case, whether, after all, Mr. Newland might not be right. However, on the third day, news was brought to him which placed the question beyond all doubt. A man who had been captured by the police and charged with another offence, when searched was found to have on him a pawn ticket relating to Mr. Newland's watch. Finally, when that gentleman, on being sent for, saw the man, he recognised him as the real thief who had attacked him and stolen his watch. He now acknowledged, with much regret, that he had made a mistake. The two men were, in fact, much alike; still, it was easy to see, to anyone looking upon the two, that one was a shabby broken-down gentleman, and the other a blackleg. It so happened that morning, Wilfred, for the first time, had sat up in bed. He asked for his clothes, and going over them, missed his manuscripts. Being informed that Mr. S—— the surgeon, had taken charge of them, he made no remark, but went on searching till he came to the unlucky penny which had been the means of landing him in his present plight. This he held in his hand regarding it dismally. "A pretty thing you have done for me, my friend," he said. "Yet, perhaps, you meant well, and this may be only another of your 'failures.' It may be that it would be as unfair to blame you, as it is to blame me for my many failures, so we won't part company just yet. We'll be companions for a little while longer." Just then Mr. S—— came up, and with a smiling face told him in a low tone what he had just heard. "So now," said he, cheerfully, "you've got that matter off your mind, my good friend. That being so, make haste to get well. I've suspected for some time what kept you back. I don't want you any longer on my hands than is necessary, you know." Wilfred smiled faintly, and spoke a few grateful words, then relapsed into the despondent look that had now become habitual to him, and said, "Of course I will try to leave here as soon as I can, but I have little satisfaction at the prospect." "Because," wearily, "I have nowhere to go to; and not a friend in the world." "But," urged Mr. S——, "your position will be different now. You will have at least one friend—the man who unjustly accused you, and by so doing caused your accident. He owes you some compensation, and admits as much. He is a millionaire, too, they say, and to him what would be a great help to you would be but a trifle. He is, in fact, downstairs now, waiting to know whether he may come up to see you to express in person his regrets." At this Wilfred flashed up, and then turned deadly pale. There came to him for the hundredth time the recollection of the look of pitying horror he had seen in the face of the young girl who had accompanied his accuser, when the latter had stopped him in the street. Never had he been able to forget the shame, the humiliation, he had then experienced. The feeling in his mind was that the whole thing had been a shameful affair that nothing could put right for him. And as for accepting money in compensation, the very suggestion seemed to turn him sick. For the first time for many a day poor Wilfred fired up, and spoke in tones full of anger and indignation. "What!" he exclaimed, "this man dares to come here to insult me in my weakness, with offers of money compensation for a foul aspersion, a wicked calumny, such as no gentleman can ever forgive! Sir, you forget! You have been very kind to me—very, very kind—thus far. You have called me 'friend.' Act the part of a friend still, and keep this—gentleman—from coming here to annoy me!" Then, his momentary access of strength failing him, he sank back trembling and almost fainting. Mr. S—— spoke kindly, soothed him and called the nurse, who, after a few words of explanation, brought a draught. The sick man swallowed it obediently, and then lay quiet with closed eyes, while the nurse wiped and bathed his clammy forehead, where were now great beads of perspiration, the effects of his late unusual exertion. "I expected this, sir, I am sorry to say; my daughter told me it would be, must be so. And now Lucy will blame me more than ever. Somehow, she's been right all through this unfortunate affair; always right at every point, while I have been everywhere wrong." He looked at the surgeon with a half comical mixture of perplexity and surprise. "Well, well, we must hope for the best. In any case my duty is to get my patient well; and if the suggestion of seeing you irritates and excites him, I must forbid it—that's certain," said Mr. S——, with decision. "Leave it in my hands for the present. Perhaps he will come round to a calmer mood ere long." But he did not, and any return to the subject only served to upset him, to such an extent that Mr. S—— was obliged to drop all reference to it. So nothing was said about Mr. Newland's repeated visits to enquire after the progress of the unknown patient. Nevertheless the old gentleman patiently continued to call at least twice a week, and generally he was accompanied by his daughter, who often made excuses to have talks with the sympathising surgeon. AT last there came a time when Wilfred was well enough to be discharged; and on a fine sunny day in August he left the ward and walked with the surgeon, at the latter's invitation, to his private room. Mr. S—— was still ignorant of the patient's name, for he had guarded the secret with a sort of dogged jealousy; and ever since the day on which he had been first asked to see Mr. Newland, he had become again reserved, almost suspicious, towards even the friendly surgeon. Walking slowly, for he was still weak, into Mr. S——'s sanctum, he stopped short and panted almost painfully, when be saw before him his late enemy, Mr. Newland. "Mr. S——," he said, turning on that gentleman with reproach in his looks and tone, "I owe you much for your great kindness to me while under your charge, but—you had no right to—"
But there he stopped; for someone had darted forward and laid a restraining hand lightly on his arm. And he saw looking up at him the same face that had been with him in thought day and night ever since it had first met his gaze that day in Shaftesbury Avenue. He could only regard her with surprise, and wait wonderingly for her to speak to him. "Oh, sir!" she cried tearfully, "can you ever forgive us for this dreadful mistake?" "Sir, I humbly confess I have done you a great wrong; a cruel wrong. But it was committed under a misapprehension. Will you not let me second my daughter's pleading for forgiveness?" Then all Wilfred's natural good nature—long suppressed and almost turned to gall and wormwood by the world's bitterly hard treatment—broke out once more, and he almost burst into tears as he took the proffered hand. "I am still far from strong, I fear," he said, trying to smile at his own display of weakness. "But I am not ashamed at feeling upset at your kindness. Coldness, slights, insults I have learned to endure—but—a—kind word—" he finished abruptly in broken accents, and turned away. "And now—may I ask where you are going?" "Nowhere; at least nowhere in particular," was the reply, given in a listless tone that told its own sad story to his listeners. "Then come home with us and have some lunch. My carriage is at the door, and we can soon drive there. I want to have a talk with you—and—er—well, my daughter, here, who feels very strongly about this unfortunate occurrence, declares she will not allow yon to refuse." Wilfred looked down dolefully at his shabby clothes and worn-out boots. "Never mind that", said his companion, divining what was in his mind. "We don't trouble ourselves about clothes." So Wilfred, after taking leave of the worthy surgeon, took his seat in the brougham with the father and the daughter—the first time he had been it a carriage for seven years, as he remembered bitterly. Arrived at the Queen's Gate mansion, he was ushered into a room where they found luncheon waiting for them, and soon the three were seated together on very friendly terms. Both father and daughter were eager to put him completely at his ease, and to show their regret for what he had undergone. Looking at the girl's lovely face, and seeing the sweet, tenderly, compassionate look in her eyes, he sighed to himself, thinking how he wished he were in a position to know more of her, and to reciprocate her friendly feeling as he would like. He felt he was momentarily falling deeper and deeper in love with her, though against his will, and was ready to rate himself a fool for doing so. "Well, now, tell me. What has brought you down in the world? I see from your talk you have been in a good position. Is it betting, speculating, horse-racing, eh?" Wilfred shook his head again. "Do I look like it?" he asked. "No," the old gentleman answered, decidedly. "But—then what is it?" "My father died, having lost his wealth unexpectedly, and left me penniless. Since then, I've been trying to earn a livelihood, and failed. That's all. I'm no blackleg, or thief, or scoundrel. Only a failure," Wilfred replied, bitterly. "But, Mr. S—— showed me some manuscripts, which he said he thought were your work. Is that so?" Wilfred nodded. "Yes, but they're failures too. Everything I sent out kept coming back to me time after time, till I had no more stamps left. Then I left them and called for them; but it was always the same thing." "Humph! Now I reckon myself somewhat of a judge in these matters. I have read your work, and if that's anything like a fair specimen, I consider you have been either very unfairly treated, or uncommonly unlucky." "You are only saying that, I fear, to try and cheer me up a little." "Ah! you think so! But we shall see presently. And now, do you mind telling me your name?" "No. It is Wilfred Hastings." Mr. Newland sprang up from his chair. "Great Heavens! Not—not the son of Mortimer Hastings, of Bristol." "Yes," said Wilfred in surprise. Mr. Newland came rushing over to him, and shook his hand violently. Then he went to the door and shouted loudly, "Lucy, come here," came and shook bands again, and fairly danced round him. Then, when Lucy came on the scene, he exclaimed, "Lucy! Lucy! This is Wilfred Hastings." The old gentleman went to a drawer, pulled out a newspaper, and brought it to him. "Look at that, sir," he said, pointing to an advertisement on the front page of the Times, "and explain how it is you have never answered it. It's been in for months." "If Wilfred Hastings formerly of Bristol, will communicate with Messrs. Bard and Barrell, Solicitors, Dane's Inn, he will hear of something to his advantage." "I never saw it," Wilfred said. "People in my position don't take in the Times." Mr. Newland proceeded to explain. "Your father failed chiefly through me," he declared. "I owed him £5000 and could not pay him. I failed myself, and that brought your poor father down. I went out to America, and I was fortunate; I made a good pile. Then I returned, intending to pay my debt to Mortimer Hastings, who had been my friend. But found he was dead, and of his son I could get no tidings. I vowed I would not rest till I had found him, if alive, and paid him back the money I owed his father, with interest. So I advertised both in London and country papers, and there's between £7000 and £8000 lying now at my bankers in your name, and you can go and draw it at once if you like." "I do believe, father, Mr. Hastings is thinking how this news will please some fair lady he has in his mind." "Not I," exclaimed Wilfred, starting from his reverie. "Thank Heaven I am heart-whole—a—at—least," he added, giving a mischievous look at her in his turn, "I was till I came into this house." SIX months later Wilfred married Lucy Newland, daughter of the millionaire, and possessed of a snug little fortune of a quarter of a million of so of her own; and Mr. Newland's prognostications of his literary talent turned out well founded, for he is known to be one of the cleverest editors of the day. And the doubtful penny, what of that? Why, it is set in brilliants and gold as a brooch, and it is Lucy's favourite ornament. To relieve its poor battered face, her monogram has been worked upon it in diamonds and pearls, and many and many a time she has taken it off to show it to admiring friends when telling this strange story of her husband and His Last Penny.